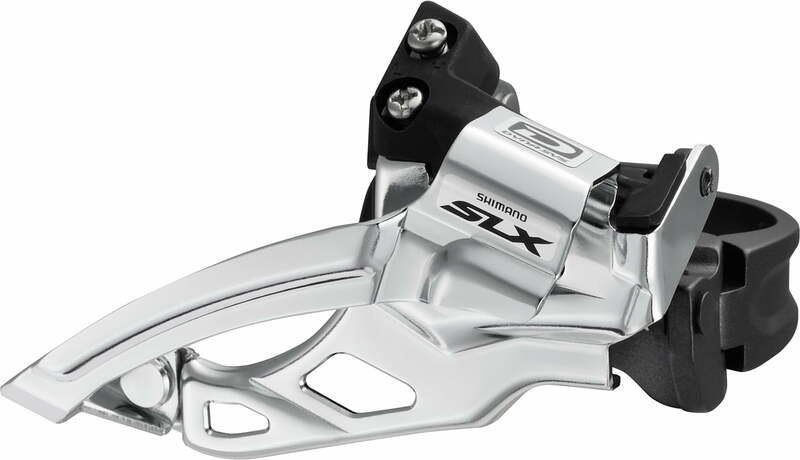 This post explains bicycle front derailleur compatibility of various makes and models. For a detailed explanation of front derailleur (FD in the rest of this post) mounting systems, cable routing and capacity, read this article: Front derailleur. 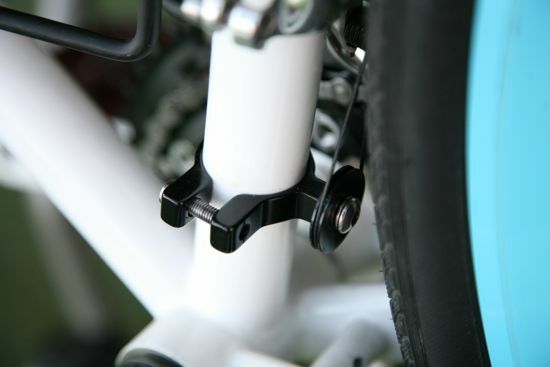 FDs are made for mounting on frame fixed braze on, or come with clamps for mounting on the seat tube. 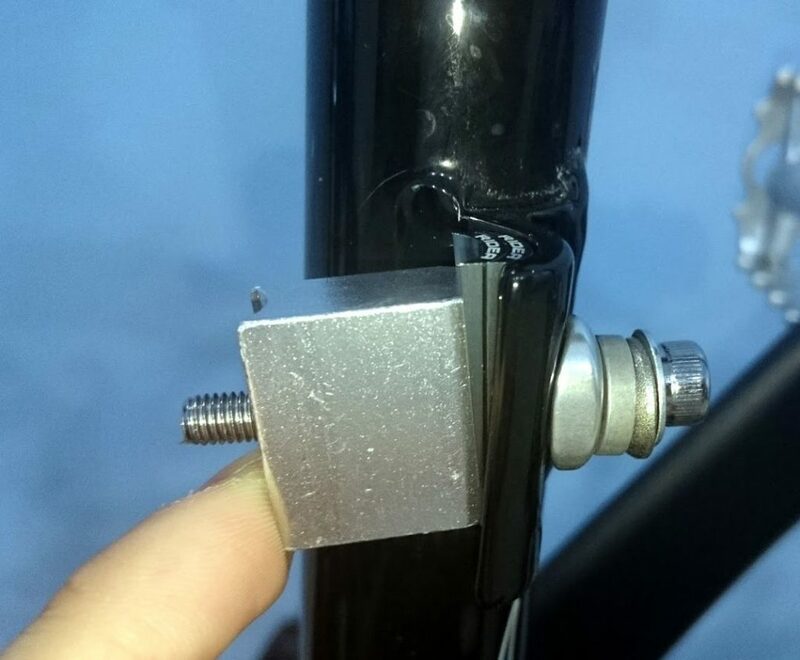 If FD comes with a clamp, seat tube diameter must match the clamp diameter. 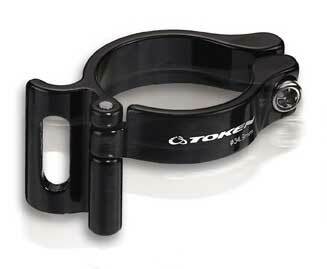 A newer standard, used on mountain bikes is the direct mount, it is explained at the end of this chapter. Braze on front derailleur. 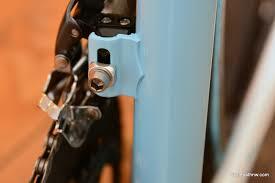 It is bolted onto a braze on derailleur holder on a frame. 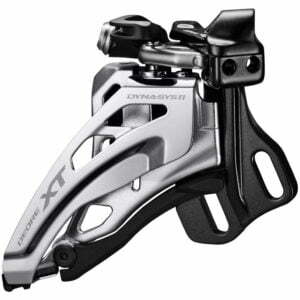 Clamp front derailleur. Clamp is fastened on the seat stay. If a frame comes with a brazed on FD mount, in order to mount a clamp on FD, the frame mount must be removed (cut off). In some (rare) cases the clamp can be put above/below the frame mount, so it can stay, as long as it doesn’t interfere with FD movement and proper mounting relative to the front chainrings. Frame with a front derailleur braze on holder. If a FD is a braze on type and the frame doesn’t have a FD hanger (or the frame hanger is too low/high for the size of front chainrings used), a separate clamp can be bought so that FD can be fixed to it. This is a much more universal type of FD. 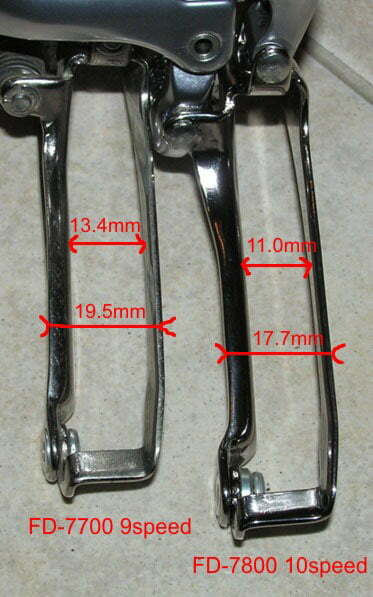 It is used when a braze on front derailleur needs to be mounted on a frame without derailleur holders. Direct mount FDs can often be fitted to a frame without direct mount attachment holes using an adapter, enabling the FD to be secured by a (threaded) BB shell. There are also adapters for frames with a round seat tube cross section of a standard width, so that a direct mount FD can be attached to them. Older system, fixed with the bottom bracket. Adapter for mounting direct mount FDs on a frame that hasn’t got the required mounts. Frames with exotic seat tubes (either by cross section that isn’t round, or by diameter that varies from the three standar sizes), often have FD mounts made on the frame. 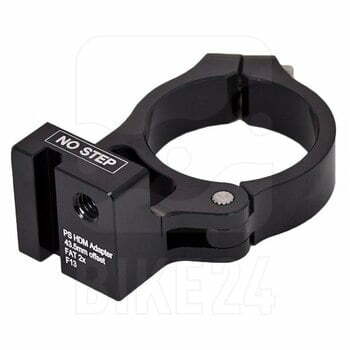 If, for any reason, those mounts can’t be used (damaged, or not fitting the FD at hand), an adapter can be used – held in place by the BB shell – for frames with a threaded BB at least. There are FDs that have a cable attached from below, from above, or from any of the two. Frames usually have only one type of cable routing. With double routed FDs this isn’t important, but for the other models, if the FD’s cable routing doesn’t match the frame design, there is a special adapter that can reverse the cable direction. 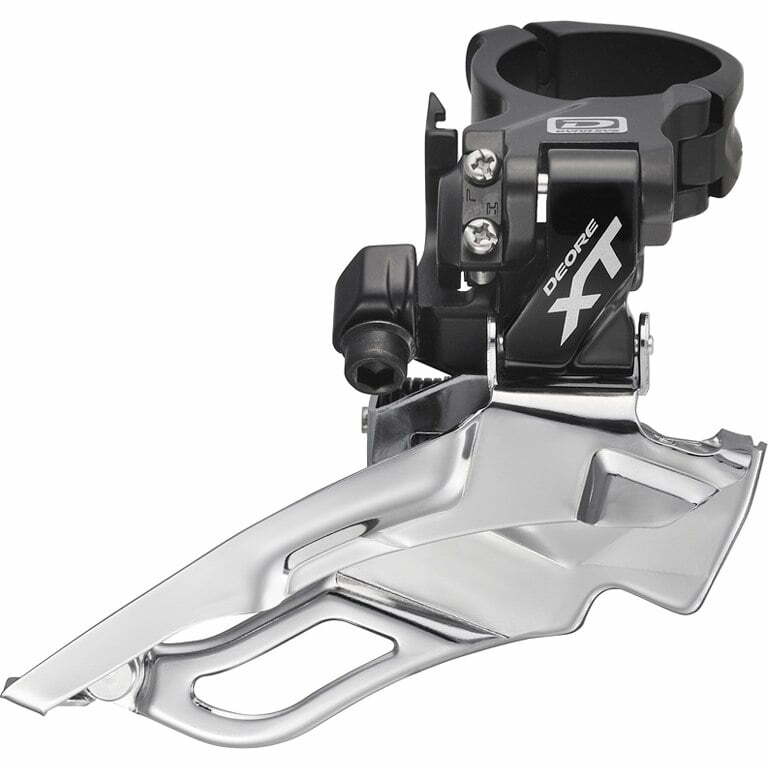 Enables reversal of cable routing to the front derailleur. Almost all the road FDs have bottom pull cable routing, while most MTB FDs have either top, or dual cable pull. FD is curved in order to align with the curve of the largest front chainring. 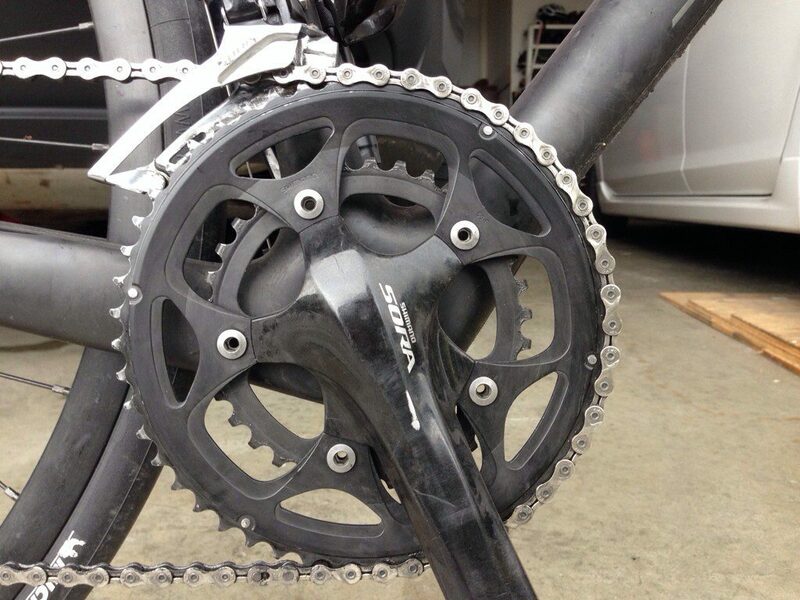 A typical MTB chainring has 42 teeth, while road bike chainrings often come with 53 teeth. A smaller chainring requires the FD to have a much more curve in order to align (and vice versa). Well placed FD that perfectly aligns with the chainring curve. Imagine in the picture above that the FD cage is shaped to match the middle chainring. It would have to be mounted either too high, or it’s rear part would bump into the big chainring, since it has too sharp a curve. Chainring has a lot more teeth than the FD is designed for: like explained above. FD will have to be mounted too high, which will make shifting slow, poor and might cause chain rub on the rear lowest part of the FD after shifting onto the smallest chainring. Chainring has a lot less teeth than the FD is designed for: front part of FD will be correctly positioned, while the rear part of the cage will remain high up, and the chainring curves sharply down. It will not align. This will not hurt shifting, but will cause a lot of chain rub on the FD cage – as soon as some shifting gears in the rear sprockets causes minimal amount of cross chaining. Seat tube angle (onto which FD is mounted) is usually about 70 degrees for road bikes, while MTBs usually have a bit steeper seat tubes, around 65 degrees. If a FD designed for more vertical tube is mounted on a tube that has a lot steeper angle, the effect will be similar to that of placing a smaller chainring designed FD on a lot bigger chainring. And vice versa. A FD designed for a lot steeper tube is put on a more vertical one. The rear part of the cage is too high, even though FD is mounted at the correct height. 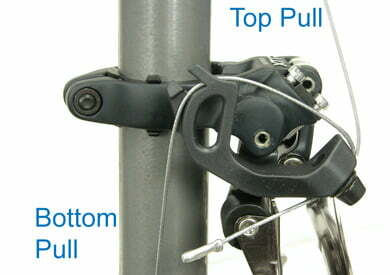 Similar problems can occur if the mounting position isn’t correct – happens on some special, or custom built frames. A frame on which, because of the low rear axle, FD must be placed a bit behind the seat tube. Adapter for changing FD angle to a steeper one and for moving it to the rear. FDs are made in two variants: for double and for triple front chainrings. Double FD will work with a triple chainring if the difference in teeth number between the smallest and the largest chainring is rather small (which defeats the purpose of a triple chainring though). For example a 34-42-48 chainring. Also, if the operation (movement) of the FD is limited to the two largest chainrings, it can work OK. Triple FD will work on a double chainring if the difference in teeth number between the chainrings isn’t bigger than 12. One can “get away” with 14 as well, but the lower difference, the better. Compact cranksets, with two chainrings that vastly differ in size (usually 34-50 combination) will work well only with double FDs with the curve appropriate for the big ring size (50 to 52). Even when using a double FD, it is best to keep the tooth cound difference up to 16 (like with 34-50, or 36-52 chainring combinations). With older standard for FDs, the cage is below the mount, so that FD cage swings below the FD body. These are the high clamp FDs. Low clamp is a newer Shimano system meant for MTBs with rear suspension. FD cage is practically in line with the mount. This leaves more room for mounting the rear suspension to the seat tube. 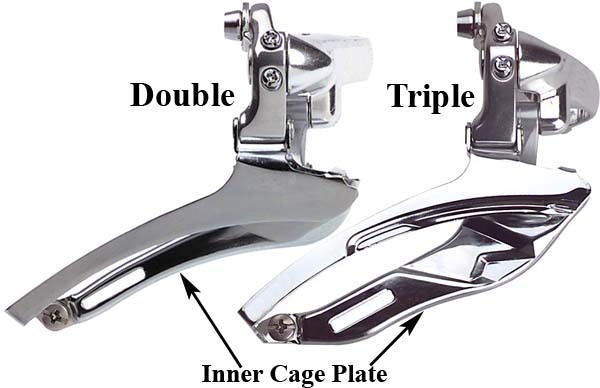 Previously used terms for this were bottom swing (for high clamp) and top swing (for low clamp), but with the introduction of Shimano side-swing system (explained at the end of this chapter), these terms are no longer precise enough. If the bike has no rear suspension, or there is enough room for a standard FD below the suspension, it is irrelevant which type of FD is mounted (as long as it’s suitable in terms of other explained criteria – angle, size etc.). 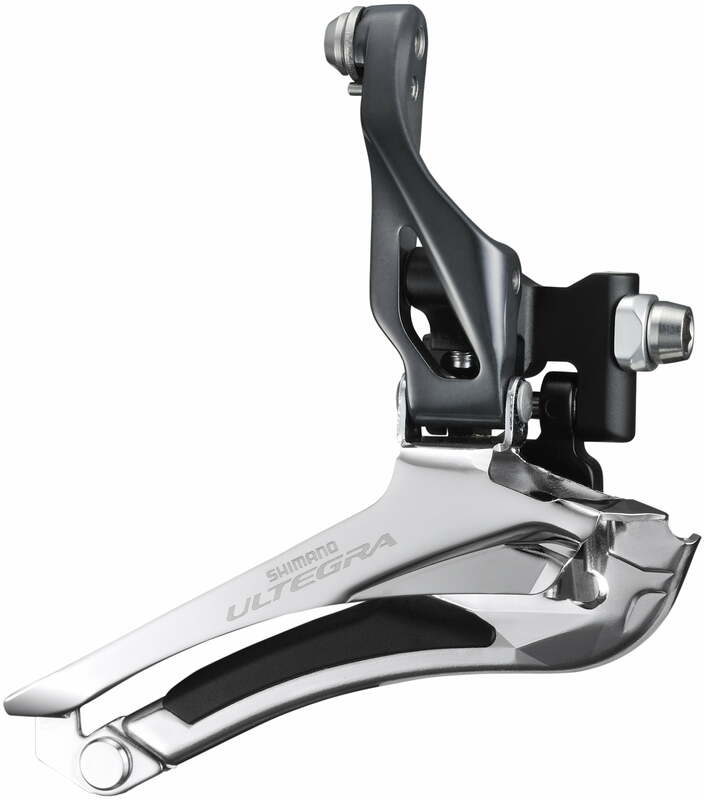 The newest Shimano system is the side-swing, where the cage rotates sideways. These FDs can be clamped with a high clamp, low clamp, or using a direct mount system. Shimano road and MTB FDs have different cable pull ratio – that is the amount of FD movement for each mm of cable movement. This means that MTB FDs might not work well with indexed road shifters and vice versa. 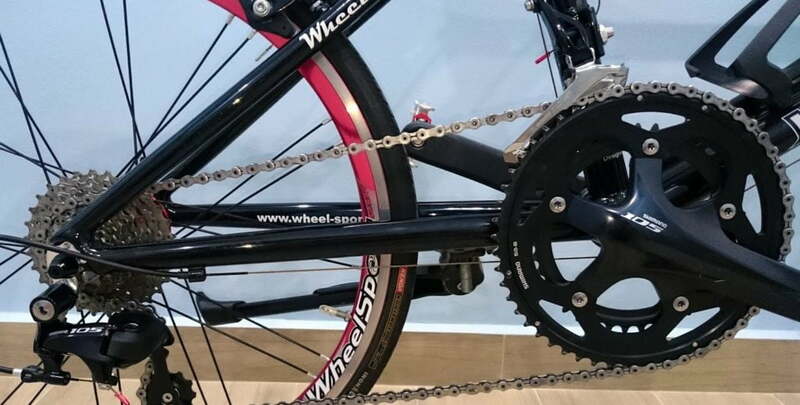 With double chainrings, this issue can be fixed with adjusting limit screws and it could be made to work. With triple chainrings, it is harder to get it to work properly. However, FD cage is a lot wider than the chain and triple FDs have just 3 positions, so depending on particular shifter – FD combination, even that can sometimes be made to work OK.
Having said all this and in spite of officially different cable pull, all the FDs almost always work OK with all the shifters, regardless whether it is road, or MTB. 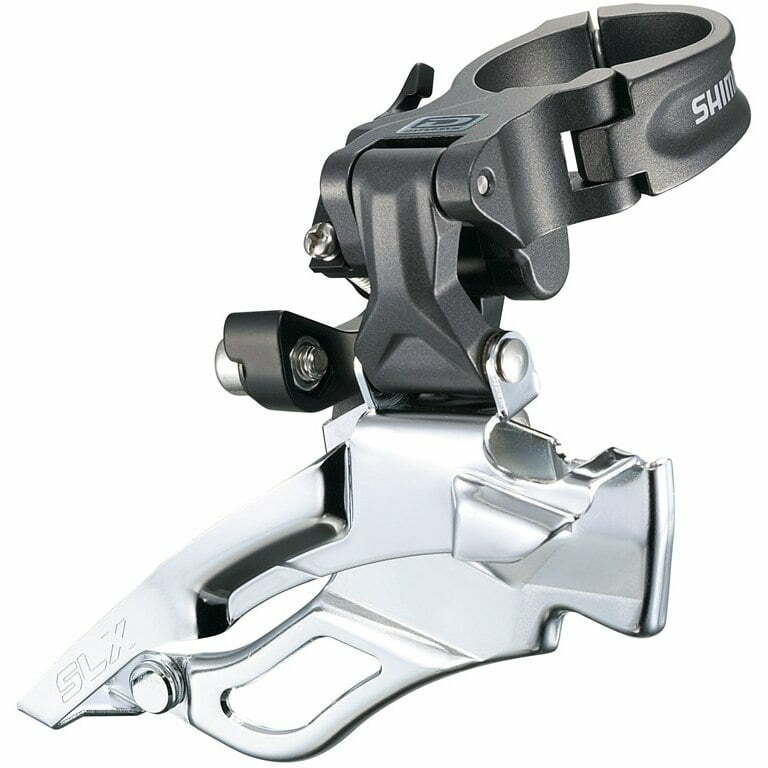 Exception are the Shimano 11 speed road FDs and Shimano Tiagra 4700 10 speed FDs – they have a (vastly) different cable pull (and cable anchor arm), so they are not compatible. So, while this will not shift perfectly, especially with triples, it is worth giving a try and seeing if it’s good enough for one’s criteria – if what one has on hand are mismatched road and mtb shifters and FDs. If it doesn’t work satisfactory, the cheaper option is to find a FD that matches the shifter. FDs are made for a certain number of speeds, i.e. number of rear sprockets. The more speeds, the narrower the chain. There are FDs for 6 to 8 speeds, then for 9, 10 and 11 speeds. Cage width is made to match the planned chain width. However, since the chain moves left-right on the rear sprockets, FD cage is a lot wider than the chain. That is why it is possible to mount a 10 speed FD and use it with a 6 to 8 speed chain. FDs are very forgiving in terms of speed number (even in terms of manufacturers), so they can be mixed and matched. One of the few pieces of equipment where it is possible to change a Campagnolo 10 speed with a Shimano 8 speed and it all works. When a FD for more speeds is put on a chain for fewer speeds, the only bad effect is more chain rub. Since the FD cage is narrower, smaller angling of the chain (when changing gears at the back) will cause it to rub the FD cage. 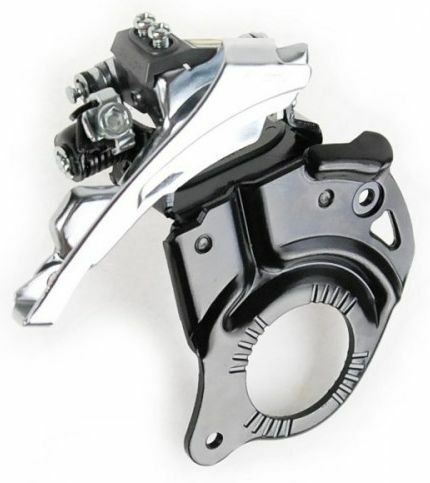 With indexed shifters, a trimming option can help, while with friction shifters this is not an issue. Exception to this rule are Shimano 11 speed road FDs. 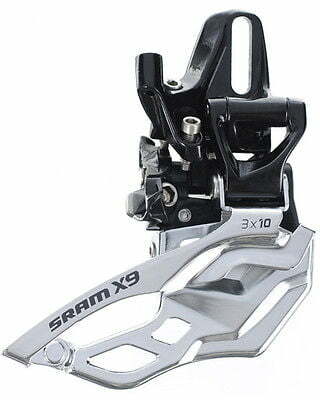 They will not work very well with anything but Shimano 11 speed road shifters and Shimano Tiagra 4700 10 speed road shifters. Same goes for Tiagra 4700 FDs. Newest Campagnolo 11 speed system: Revolution 11+ (older one is Revolution 11) also requires matching (Revolution 11+) shifters and derailleurs. The reason for incompatibility lies in different cable attachment and amount of needed cable pull per gear change. Why was something that had already worked “fixed” has probably more to do with the marketing, than with the engineering department of the company. Excellent information – thank you. Have been hunting the internet for answers on FD angle of inclination / curve to match front chain ring – and at last found the answer I needed .